In June 1995 the RAFES laid up its Continental Standard in the British Embassy in Paris, where it began 50 years earlier. 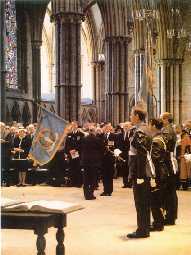 A Gala Dinner was held at RAF Cranwell the night before the laying up of its UK Standard in Lincoln Cathedral during the Battle of Britain Service on 17th September 1995. The RAFES was formally wound down. The post war Foreign Secretary in the first Attlee Government was Ernest Bevin. Europe than all my Ambassadors rolled together."